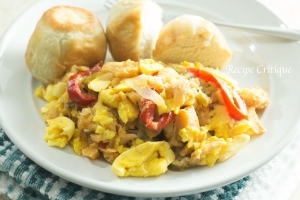 As the countries national dish, Jamaican ackee and salt fish is enjoyed by many around the world. Originating in Africa, the ackee fruit was imported into the Caribbean in the 1700;s. The fruit grows on trees in a red casing that resembles a small red bell pepper. When it ripens the red casing opens to reveal black seeds and yellow flesh. There is some stigma associated with the ackee fruit as it contains a poisonous toxin. 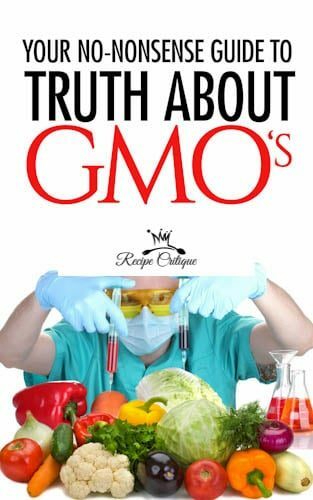 The fruit must be allowed to open naturally to release that toxin before the yellow flesh can be eaten. The dark seeds inside the fruit are also inedible due to the toxicity. The jewel of the ackee fruit it the yellow flesh that we can and do enjoy eating. You may wonder with the concerns of toxins and the safety of consuming ackee, people still choose to eat it. There are several amazing benefits to be had from consuming ackee. Lowering blood pressure and cholesterol, improving the immune system, aiding in digestion and circulation are just a few. Ackee also contains vitamin C, calcium, iron, zinc and a natural plant protein that we all need. Historically cod was salted as a means of preservation. 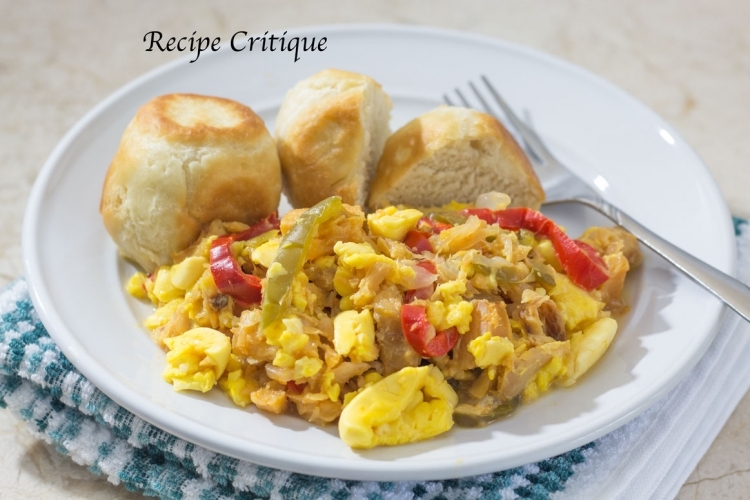 When salt fish is mentioned it is more than likely a reference to salted cod fish, although other types of flaky white fish has been used to make ackee and salt fish. Much of the salt needs to be removed before the salt fish is edible. This is achieved by soaking the fish in water anywhere from 2 hours to overnight. Regularly changing of the water helps to expedite this process. The salt fish is traditionally cooked with onion, garlic and peppers, which makes it the perfect pairing for the mild flavored, buttery creaminess of the ackee fruit. Rinse the codfish in cold tap water to remove excess salt. Place in a large bowl and cover with cold water and soak for an hour. Drain the water and refill to soak for an additional hour. The soaking process can be repeated one more time if desired, to remove as much salt as you like. Heat a large skillet over medium high heat. Add the avocado oil and heat until hot. Add the onions and sautee until translucent, about 5 minutes. Add the bell pepper, garlic and thyme and sautee and additional minute, until fragrant. Reduce heat, add the saltfish, black pepper, ketchup and lemon juice. Stir to blend. Cover and simmer for 5 minutes. Add the ackee and gently mix to combine. Ackee is a very delicate fruit so mix gently so as not to crush it up. Cover and simmer an additional 2 minutes or until heated through. Serve while hot. Ackee and salt fish is traditionally eaten as a breakfast dish in Jamaica, but can actually be eaten any time of the day. For breakfast it is typically served with fried foods such as dumplings and plantains, a sweet banana. For the evening meal you are more likely to find it paired with boiled dumplings or potatoes, and some boiled yam and banana. Either way, this is one dish you do not want to pass on. The dish will put you in the Caribbean mood in no time.